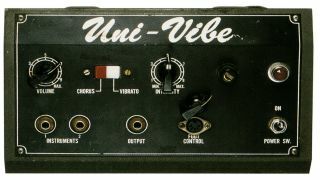 The Uni-Vibe was conceived as a pedal alternative to a Leslie speaker. It should come as no surprise, then, that one of its first proponents was Jimi Hendrix, who prolifi cally used a Leslie rotating speaker. Unlike most commercially-produced-phase-shifters, the Uni-Vibe doesn’t employ op-amps in its circuit, instead using discrete components in its design. At heart, it’s a four-stage phaser, with controls for intensity and output volume, as well as a mode switch for the colour of the pedal. Crucially, the speed control is tied to a foot pedal, and freed from the mechanical limitations of a motor altering its speed, the Uni-Vibe can change speed much more dramatically. This meant that instead of the ‘fast’ and ‘slow’ options of a Leslie, the Uni-Vibe’s speed was a continuous range. Originally conceived by engineer Fumio Mieda for the legendary Shin-ei company, the unit was manufactured and distributed by Univox in North America from 1968 onwards. Although it was most common to see a foot pedal used to control the speed of the effect, a box with a potentiometer was an option. There were two main versions of the original unit. The first is distinguished with a grey power cord and hand-painted ‘Uni-Vibe’ on the front; this is the true ‘Jimi’ version. The later version has a stencilled logo that is more silver in colour. Despite forum wars raging over which unit is the true classic, individual units diff er greatly, leaving some collectors forever seeking out vintage specimens in pursuit of the ‘perfect’ Uni-Vibe tone. The volume control is a simple output attenuation potentiometer, although it’s worth noting that the pedal contains a transistorbased preamp circuit, so even the ‘dry’ input signal is coloured and amplified. When in chorus mode, the pedal blends the dry signal from the preamp and wet signal to create its distinctive phased sound. In Vibrato mode, only the wet is heard, leading to both a thinner and quieter effect, but also one with a much more pronounced pitch warble. The intensity control governs the depth of the sweep, and on most clones and successors would come to be simply called ‘depth’. This control has a broad range, going from subtle to almost unusable when maxed out. The Strymon Lex is a rotating speaker simulator with additional non-Uni-Vibe controls for horn and mic distance. That aside, it’s possible to get fantastic Uni-Vibe sounds out of the unit. One of the main things that the Lex has over the original Uni-Vibe and most of its successors is stereo output. It also boasts an expression pedal input and dedicated preamp gain control. Dunlop bought the rights to the Uni-Vibe name, and the MXR M68 claims to be a faithful reproduction of the original. In its favour are a compact form-factor and intuitive controls, as well as an obligatory expression input, but purists grumble that it suff ers from some of the weaknesses of the original, like a tendency toward ‘thinner’ sounds with certain settings. With the Deja Vibe, Fulltone has the best-known Uni-Vibe replacement. Its oversized speed knob often had guitarists manipulating it with their feet, leading to this, a rocker-pedal enclosure version of the Deja Vibe Mini. It uses fully discrete components, and is true bypass – the point at which it strays from the design of the original. Be like the master of the Uni-Vibe and pair these settings with a fuzz pedal for full Band Of Gypsys level madness... Jimi Hendrix style! Make sure that you use the speed control in an expressive way to accentuate lead passages, and match the lead riff’s tempo as closely as you can for rhythm playing. Wilson’s solo and Porcupine Tree work is covered in one of his trademark clean tones; a vibrato pedal emulating a Uni-Vibe or rotating speaker. He has used several diff erent units, including the excellent Diamond Vibrato with the speed turned down to give movement to arpeggiated chords in clean sections. To achieve something of a more subtle Hendrix-like tone, try this setting into a clean amp. With the speed set in a moderate position, more emotive passages of arpeggiated chords and subtle leads can be delivered without the searing attack of more extreme settings accentuated with fuzz.